This map editor was specifically created for the purpose of streamlining Westerado: Double Barreled‘s level design and to support the new optimized level structure we had implemented for that. 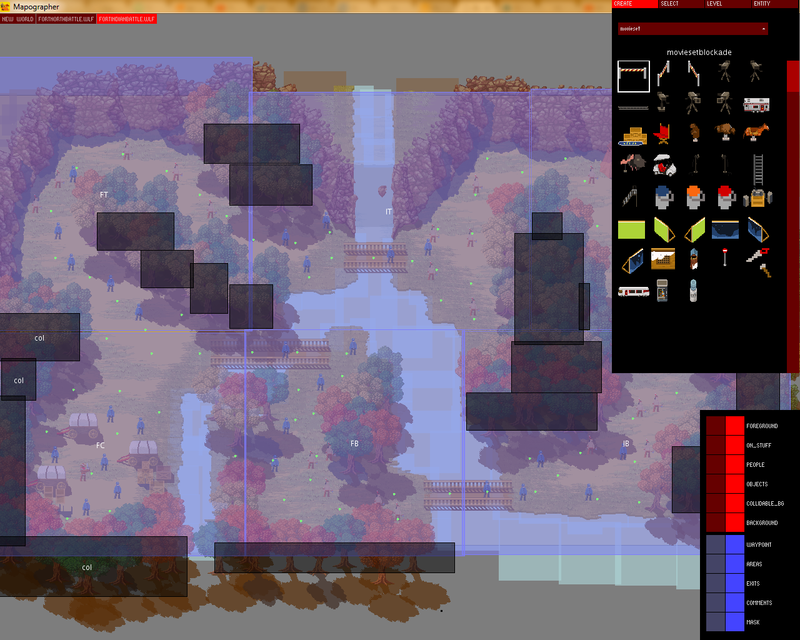 In essence Mapographer is just a very basic map editor with drag and drop functionality and a layer based system that was especially useful with the weird perspective in Westerado. The main requirement of Mapograpger was that it should directly be able to use any asset created by our artist, without having to first import or define it. The editor would just separate them into pages defined by the folder names and the designer would be able to then use any asset in the selected folder and just drop it into the level. Having our own editor simplified things a lot, at one point we realized that players would try to walk in between groups of trees and get stuck, which led to the creation of a new type of layer that would just be used for collision masks. Having to hack that into another editor could quickly make things look messy, but with our own editor we could add toggles to hide the layer or make it the only thing you’re editing. Another thing it allowed us to do was to add native support for trigger areas, which is one of the most basic building blocks used to create more complex situations using BloXcrypt. Back when we were using Ogmo we used these rectangular areas to trigger certain effects in the world, but the way we did this was through the use of a specific area layer, where you could paint black areas over top of the world. This was perfectly fine up until the point where we wanted the areas to overlap, because we would have to add another layer on top to do that. We also had to put specific blocks on top of the trigger area in the level to actually link it to the right functions, which combined with the other issue led to a cavalcade of undiagnosable problems, because it became a total mess. This was one of the biggest things we fixed with Mapographer. The first thing we did was make the area layer a specific type of layer, one where you could just drag a box and it would work. You could then name the area. This served 2 purposes, if there was a trigger in the BloXcrypt that had the same name as the area they would be automatically linked, otherwise triggers could refer back to the area by name for filtering out objects inside or outside of the area. These areas were also drag and drop accessible, which was also a lot better than having to redraw them each time you wanted to change it a tiny bit. The last thing we changed with Mapographer was the way entering and leaving levels worked. In the original Westerado we used the trigger areas to teleport players from stage to stage, so you had to open up both levels and set up the teleport from one level to the other level and vice versa. This was time consuming work, that was especially annoying when you had to add a stage in between 2 levels. With Mapographer we decided to add an exit layer, which allowed the designer to just drag a line along the edge of the level, where it could connect to another level. This had the added benefit of being able to determine at what point the player hit the exit, so the game could put the player in the same relative position on the other side, instead of just in a predetermined spot. When an exit was selected it could either be left blank, so the designer could use World Builder to link it to something else, or it could be given a predetermined hard link to an exit in another level, like the old system.